Not sure how many people have been running into this problem but because it happened to one of my coworkers today I thought I should blog about it. The problem was the following: We added the p2-update possibility to an application at the end of our product development like it is shown in the cloud example found in rt-CVS, we correctly added the p2.inf-File and exported the application but die Update did succeeded because there’ve been no repositories configured when the application was exported. 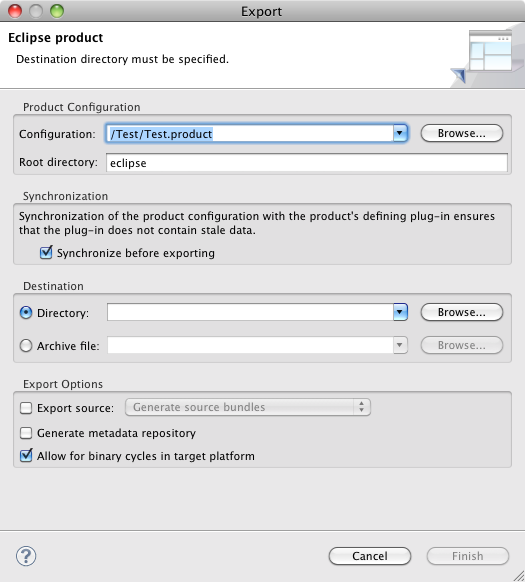 It took us some time to figure out what he did wrong and the solution though obvious, logic and simple is something others could easily miss also when exporting from the Eclipse IDE. Like I said: Obvious, logic and simple to fix but my coworked nearly gave up. So should the export wizard when finding a p2.inf in the project not at least warn if the “Generate metadata repository” is not checked? I’ve been bitten by this too. Also, if you fail to check this box, the resulting application isn’t updateable at all. I agree that there should at least be a warning if you fail to check this box. It seems that the explanatory text next to the checkbox could be better.